Washing machines break, car alternators fail, and pipes burst. How do you prepare for inevitable moments of crisis? A new report reveals that a large percentage of Americans are living on the financial edge, just one unfortunate event away from disaster. $72 Million Lottery Winner Says She’ll Stay At Her Job. Would You? Georgia lottery winner vows to keep working. Would you? Saving money is harder than we think. Consider these simple tips for putting more money in your nest egg. You can slash the cable bill, cancel the gym membership, and turn down the thermostat all you want, but these steps will pale in comparison to the savings you’ll realize simply by cutting your grocery bill. What if you could peek into the minds of some of the most brilliant forward-thinkers and entrepreneurs around? 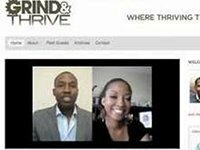 That’s exactly what Torrey McGraw, founder of GrindandThrive.com has done for you. Learn how to simplify your finances with the Balanced Money Formula. You have the time to make big changes in your life. The question is, will you use it or let it go to waste? George Lucas spends his own money to bring the story of the Tuskegee Airmen to the big screen. Four year college graduation rates for African-Americans stand at 40.5%. Find out what you can do to increase your child’s chances. In an arena we’re less than 1% of all technology start-ups are created by African-Americans, these three Morgan State alums have created a product that will help you find the perfect gift for those special occasions. Bank of America has agreed to pay $335 million dollars to settle allegations that it’s Countrywide Financial unit discriminated against minority home buyers. Taking the holidays off from your job hunt might be a huge mistake according to a recent Wall Street Journal article. In fact, the holidays might just offer the perfect job-hunting opportunity. This month’s issue of Essence magazine shows how the recession forced three women to re-examine their lives, harness inner strengths, and embrace new realities. Procrastination in completing the FAFSA form could cost your child financial aid money. Revelations from banking insiders themselves show banks played a leading role in the foreclosure crisis, often preying on minority borrowers in the process. Think you don’t have the grades or money to go to college? Think again. The College Board shows you how anyone can go to college.